The National Federation of Roofing Contractors (NFRC) – the UK’s largest roofing trade association – has unveiled an ambitious four-year Workforce Development Strategy that is designed to elevate standards and ignite growth across the roofing sector. Seeking to attract full government and private sector backing, support and engagement, the new strategy will ultimately open doors to new jobs, higher standards, and help reach UK Construction targets. This landmark development is the result of an independent and extensive research project undertaken by Skyblue Research on behalf of NFRC, the Roofing Industry Alliance and funded by the Construction Industry Training Board (CITB). 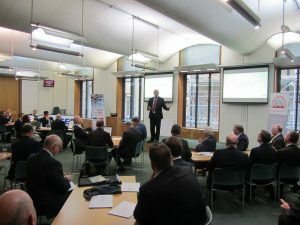 The research set out to identify the key challenges facing the roofing sector and after engaging with a cross-sector group of 141 UK-based roofing contractors, it concluded that a revival in the roofing sector could be kick-started by satisfying three key objectives. These objectives form the cornerstone of the Workforce Development Strategy. Objective 1: Establish the roofing sector as a professional, modern, respected and aspirational sector with clear career paths; able to attract the best and the brightest apprentices, students and new workers. Objective 2: Formalise and standardise a higher UK-wide training, accreditation and assessment infrastructure: to upskill and multi-skill its growing workforce. Objective 3: Proactive engagement with all roofing sector companies, suppliers and trade associations, and seeking endorsement and commitment from all procurement stakeholders: enabling growth, increased training, and access to grants and higher standards. Commenting on this significant development, James Talman, Chief Executive of NFRC said: “It’s well known that any chain, process or greater goal is only as strong as its weakest link, and without doubt the roofing sector has long felt like the poor relation of the construction industry. We have a major image problem due to a lack of clear differentiation between a qualified skilled worker and an operative who calls him/herself a roofer after carrying out a health and safety test. “The Workforce Development Strategy sets out to provide insight into the specific areas of recruitment, training, accreditation and modernisation, that are perceived to be lacking in the roofing sector. By adopting the three key objectives recommended in the report and obtaining Government backing for roofing, there would added benefit to the wider construction industry, apprenticeship and employment figures, and the UK economy as a whole. We are confident that we will see a resurgence in our sector,” adds James. James concludes: “The roofing sector recognises its own weaknesses, yet holds a growing belief in the potential that could be unlocked. Many of the actions and objectives required to revitalise our industry as a career of choice can be taken by us collectively.